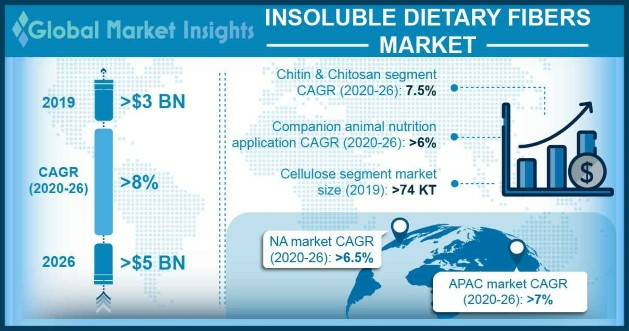 Global Insoluble Dietary Fibers Market size is set to surpass USD 4.5 billion by 2024; according to a new research report by Global Market Insights. Potential applications in food fortification due to rising functional food demand globally will propel the insoluble dietary fibers market size. Rising dairy, bakery & breakfast cereals demand owing to changing diet patterns and increasing health consciousness has enhanced the product demand. Effective functions including water binding, thickening, gelling and fat replacing are among key factors supporting product adoption. Shifting trend towards fiber supplements to fulfill nutritional requirements provides huge opportunities for the insoluble dietary fibers market growth. Increasing incidences of several diseases due to hectic schedules and unhealthy diet influencing inclination towards healthy supplementations will support product demand. Significant benefits in treating diverticular diseases, constipation, colon cancer and enhancing weight loss are among key properties fueling industry growth. Cellulose market was valued at over USD 700 million in 2017. Notable properties in improving gut health, immunity from illness and resisting bad bacterial growth has stimulated the product penetration. Ready commercial availability of cellulose coupled with abundant availability of raw material mainly consisting whole grains further propels the insoluble dietary fibers demand. Extensive investment in R&D and product formulation coupled with prolonged regulatory approval procedures are the major restraining factors for industry growth. Changing economic & climatic conditions causing cost fluctuations in grains, fruits & vegetables may influence the insoluble dietary fibers price trend. Fruits & vegetables are anticipated to witness gains around 8.5% by 2024. Shifting manufacturer preference towards fruits & vegetable sources due to ease in procurement and production has enhanced the product demand. Substantial nutritional content in fruit peels provides positive outlook for insoluble dietary fibers market growth. Reduced risk of hemorrhoids, diverticulitis and cancer are among major health benefits driving application scope. Bakery applications will observe revenue growth at over 10% from 2018 to 2024. Considerable demand for natural and healthy bakery products including nutritious biscuits & bread will support the insoluble dietary fibers demand. Increasing product adoption in bakery due to high water holding capacity, preventing dryness will propel the application scope. North America registered largest revenue share, accounting for over 35% of the insoluble dietary fibers market in 2017. Growing consumer awareness pertaining to health & safety along with changing lifestyle are among major factors driving regional demand. Increasing prevalence of obesity and diabetes stimulating trend towards weight loss procedures will fuel the business growth. Dupont Danisco, Roquette Frères, Cargill, Sunopta, Ingredion Incorporated and J. Rettenmaier & Söhne are among major industry players. Global insoluble dietary fibers market share is highly fragmented with presence of international as well as regional manufacturers. Other notable players include Tate & Lyle, Grain Processing Corporation, Solvaira Specialties and Ceamsa. Technological upgradations, R&D investments, mergers & acquisitions are among major strategies adopted. For instance, in March 2017, Ingredion acquired Sun Flour Industry, a Thailand based rice starch & flour company to enhance its starch ingredient portfolio. Companies are also focused on geographical expansions and product developments to capture substantial industry share.